Delightful ancient stone farmhouse in Tuscany with swimming pool comprising 3 charming restored apartments affording wonderful and extensive views over the Chiana Valley. The farmhouse is situated on a hill, in a short distance from the renowned town of Cortona whose origins date back to the Etruscan period. 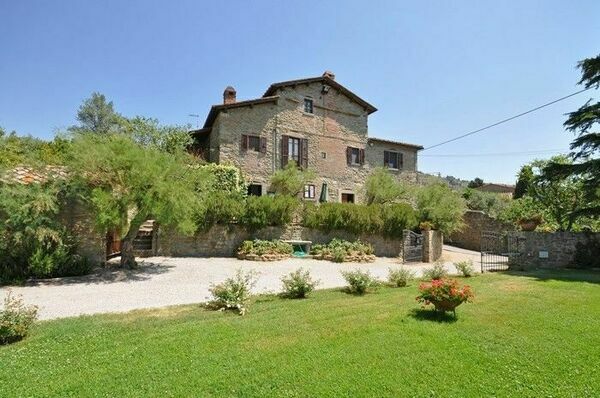 All of the 3 apartments are nicely furnished in the local Tuscany rustic style. Distances: the centre of Cortona with all kinds of shops 1 km, Lake Trasimeno with equipped beaches approx. 10 km, Arezzo with a charming antique market about 30 km, Perugia 50 km, Siena approx. 55 km. A secondary road passes near the farmhouse. At guests' disposal: fenced and terraced garden equipped with garden furniture, bowling-green, barbecue, shared, above-ground swimming-pool (7,5 x 4,5 m - open from 01/05 to 30/09) and TV in each apartment. Shared laundry with washing-machine and iron. Parking in the property. Horse-back riding facilities close to the house. Pets are allowed. By renting the 3 apartments together it is possible to obtain an independent villa with private swimming-pool sleeping 10-13 people. Extra services: baby cot available by paying an extra charge of € 42,- / per week to be paid on the spot. 100 m2. 1st floor: living-room with fireplace and sofa-bed, kitchen (freezer, American coffee maker, toaster), 2 double bedrooms, bedroom with a single bed, bathroom with tub, bathroom with shower (hairdryer). Additional costs paid on site: Security deposit: € 150,-Final cleaning: € 50,- (to be paid at reservation) Heating: € 15,- / per day.Local tax: € 1,50- / per person / per day for the first 4 days of stay (not applicable to children under 12 years).